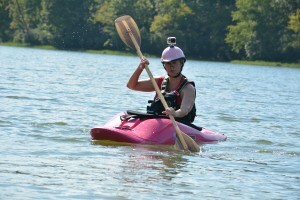 Club President Helen Todd kayaks a lake at Oak Mountain State Park. When life is feeling stale and you need a break in your routine, the Magic City delivers. From 14,000 feet in the air to hundreds of feet under ground, we found the best adventures in the Birmingham area. This is part four in a six-part series. Meets the first Tuesday of each month at 7 p.m. Pick up a paddle and take on the rush of whitewater or the sweet calm of a placid river. The Birmingham Canoe Club organizes canoe and kayak trips for paddlers of every skill level. Helen Todd, the club president, said the Canoe Club started in 1971 to “provide a community for people who want to learn more about paddle sports in general.” She started kayaking 16 years ago and is now one of over 120 active members. “It’s a great hobby; it’s exciting. You meet new friends. It’s a different kind of way to get out and get outside,” Todd said. The club adjusts its paddling locations with the seasons. Winter rains bring whitewater to Birmingham-area rivers, including club-owned property on the Mulberry River. In the summer, Todd said the club travels to south Alabama, Georgia and Tennessee to seek naturally occurring rapids. There are classes in the summer to teach new paddlers about safety and technique, as well as February and March races on the Mulberry and Locust Fork rivers. Todd said the club is also able to rent out boats to people who do not have them. Some members work their way up to kayaking on whitewater, while others stay quite happily on lakes and smoother rivers. The Canoe Club is all about simply enjoying a day on the water. “If you’re comfortable in the water and you like being outdoors and you don’t mind camping, this would be a fun sport for you,” Todd said.